The iconic jeans brand unveiled its new 16.902-sq.-foot two-level (plus a mezzanine area between the main ground floor and the basement selling areas) flagship in New York’s Times Square on Thursday night with a packed private opening event that included on-site customization and live performances from New York music acts. The new location is nearly double the size of Levi’s previous Times Square store, which was 8,800 sq. feet, and emphasizes one-of-kind in-store experiences with an expansive Tailor Shop, customization options from local artists such as Futura and 13th Witness and merchandise that is unique to the location, including Mickey Mouse x Levi’s “I Love NY” offerings. It also carries the largest assortment of Levi’s products available anywhere including the offshoot brands Levi’s Premium, Levi’s Made & Crafted, Levi’s Vintage Clothing, Levi’s Authorized Vintage, Levi’s Collaborations, Accessories, Footwear and Kids. 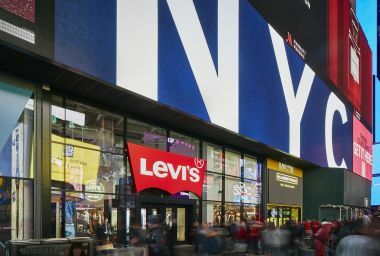 The new flagship is one of six stores Levi’s operates in New York City (five in Manhattan and one in Brooklyn).